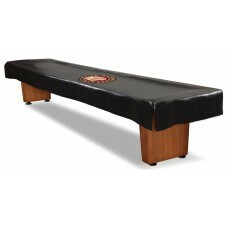 Protect your expensive Shuffleboard table with an officially licensed Indian Motorcycle vinyl cover. Show off your pride for the oldest American motorcycle manufacturer with a commercial grade shuffleboard table cover made from marine grade vinyl and printed with UV resistant inks. Available in 12' length. Made in the USA and perfect for any motorcycle chapters hang out hall or the game room in your home.